In 1997, I began to make plans for the 1999 eclipse—the last Total Solar Eclipse of the Twentieth Century. Because I had already led a photographic safari in Kenya in the early 90s, I thought I might do the same thing with an eclipse trip. The idea was that I would teach seminars about eclipses and astro-photography to a group of about ten people and then we'd go on a ship that sailed the Black Sea near Turkey (the place that seemed to have the best summer prospects for clear skies along the eclipse path). I prepared a brochure for the group, put it on the net and then sent it out to friends, family, and photography clients. I made the above picture for that brochure. The building is the Sultan Ahmed Mosque or Blue Mosque in Istanbul. 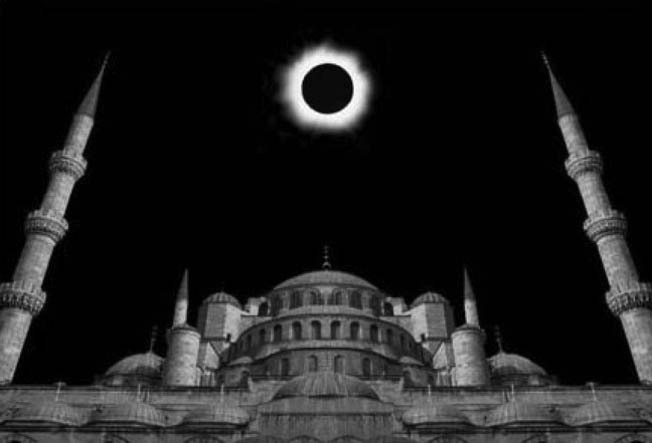 I thought that it was fittingly picturesque, and, because it was in Turkey, it was also appropriate, although, technically, it was not in the path of totality. I got the picture of the mosque from the Internet; the super-imposed picture of the eclipsed sun was one I had taken of the 1991 eclipse in Mexico. I had a number of nibbles for the trip and some real interest, although few firm commitments, but I was determined to go anyway. The cruise was excellent in every way except one: the shipboard preparations for the eclipse. Apparently very few people, including the guests, the crew and staff, knew or cared much about solar eclipses. It was a cruise, the final voyage of a venerable ocean liner, The Norwegian America Vistafjord, last cruse ship of the The Norwegian America Line. Out of the 600 or so passengers, only twenty were fellow astronomy-buffs. The rest were there for the pleasures of luxury and visits to the various ports of call: Troy, Istanbul, Yalta, Odessa, and Venice. Surely, more than enough attractions for anyone, without a solar eclipse. The ship had hired two scientists to give lectures, but they were sparsely attended. 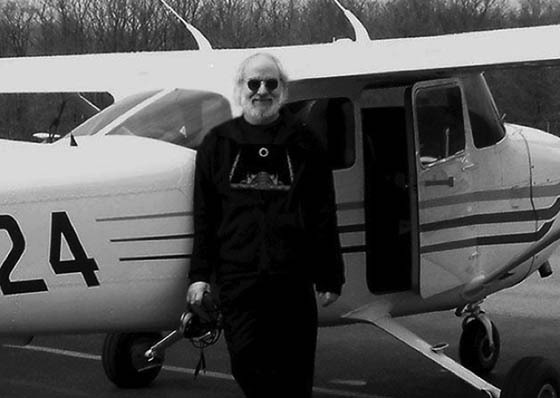 Only the fine astro-artist, Jon Lomberg, seemed to connect with the passengers, and he evinced real enthusiasm throughout the entire cruise. The day of the eclipse arrived clear and bright, and I went out on the main aft deck. The eclipse would take place at around 1 pm, so I got there with my stuff just before noon. And what was going on? Were the scientists on deck with their scopes giving talks? Was there a buzz of excitement? No, there was a fashion show. A Pilipino rock band played out. Preparations were being made for the regular Wednesday bar-b-q. Colorful clothes for sale were spread out on a vast array of tables. Hardly an atmosphere conducive to the awesome astronomical event that was to come. I talked to Gesa, the friendly cruise-director, and I asked her if she could get things toned down a bit. I assured her that what she and all aboard were about to see might prove to be a terrific experience. She agreed and succeeded in curtailing most of the events. Smartly, the ship had bought mylar and cardboard eclipse viewers, and they were passed out to everyone. By about 12:30, most people had eaten lunch, the band had quit playing, and folks were settling into their desserts and third beers with growing anticipation. Then the sunlight began to dim. And dim. Inexorably, the shadow of the moon, unseen to us, was approaching the ship from the west. The eclipse was beautiful. For two and a half minutes, everyone was focused on a small black circle with a white shimmering fringe high up above. The sky was a deep, dark blue and the horizon, all the way around, glowed pink. Mercury and Venus could be seen. People— passengers, crew and staff, alike—were excited and awestruck upon the calm Black Sea. After it was over, and when broad daylight had returned, I asked Gesa if the ship would be offering any mementos of the stunning occurrence we had all just been part of. A T-shirt, perhaps? She said, sadly, that the company had not thought of anything like that. She agreed that it would be a great idea, she even wanted something of the kind for herself, but she saw no way of providing any such service. She said I was free to do whatever I wanted, but the ship would not be involved. Unfortunately, the ship was not properly set up to receive or print pictures from the Internet. But, when we got to Istanbul, our first port of call after the eclipse, I set out to find a place that had Internet access and a printer. Heck, I wanted a T-shirt! So I went ashore and wandered around looking for a high-tech place in the ancient city. And, wouldn't you know it: I found a little Internet cafe that was a block away from, and literally in the shadow of, the Blue Mosque. The shop was run by an Australian expatriate. He had everything I needed, and, for one dollar, he got on the net, went to my site, found the brochure, and printed out a nice, dot-matrix 8x10 of the mosque/eclipse image. On board the ship, I prepared a sign with the picture, and then I walked the decks with it. I told people, lounging on their deck chairs or peering from the rails, that, for $28 US (I had no idea really, but I figured that was a nice, fair amount), I would produce an all-cotton eclipse T-shirt for them, tax and shipping included. I had never done anything like this before, not even close, but I was sure it was do-able. Yes, ignorance is bliss, but I got a lot of people to believe me. No hard sell, the picture and people's memory of the eclipse did it all. By the time we disembarked in Venice, I had taken names, addresses and orders from over 150 people. Once back home, I found a T-shirt maker in Stamford, CT, and I learned a whole lot about silkscreens, resolution and hand-painted cotton. A month later, I sent out Last Total Solar Eclipse of the 20th Century T-shirts to people all over the world. In the end, I got the souvenir T-shirt I wanted and made some money, too. No, not enough to buy or fly a plane, but enough for a lesson in my new T-shirt. At 6 AM on the morning of June 8, 2004, a group of Rye Neck middle and high school students, along with some of their parents, gathered with me at the gym parking lot to witness a Transit of Venus. I had scoped out the area in advance and figured it was probably the best place on the school grounds to view the event. There was a clear view of the east and only some distant trees just above the horizon. 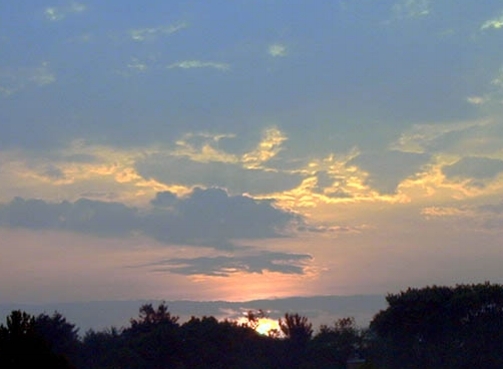 It was rather hazy and gray, but the rising sun was visible through the scattered clouds and mist. The sun had just cleared the distant trees by about 6:45, and the black dot that was Venus was easily seen with Mylar-protected eyes and binoculars. 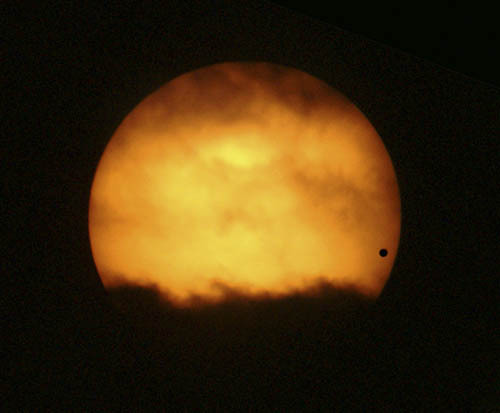 The transit was well under way and almost over when we, on the east coast, got to see it. By 7:20 AM, the little dot had made its way across the lower right area of the sun, got to the edge of it, and disappeared from view. It was quite a thrill, and, for many of them there, it may have been a once-in-a-lifetime thrill. But the way it works with Transits of Venus is that they come in pairs, eight years apart. And then not again for 105 years. The last Transit of Venus was in 1882. So, after the transit, and before we all went to school extra early that day, I told everyone in the parking, and all my classes, that, if we were lucky enough to be around in eight years, and weather permitting, I would meet with them again on June 5, 2012. And that day came to pass. I had been retired from teaching at Rye Neck for five years, but, thanks to Facebook, I was still connected to a number of old students. Of course most of them, eight years later, had already graduated, but a few of them texted me about the second transit. I announced on Facebook that a day or two before the event I would post a time and a place to meet ... again weather permitting. But on that day, the weather did not permit. It was mostly cloudy on the 5th, from early in the morning, and all day long it was mostly cloudy and sometimes overcast with a chance of rain. What made matters even more problematic was the fact that the transit would not start until 6:20 PM and would still be in progress when the sun set about an hour and a half later. So, even if skies cleared a bit, we would only have a very small "window of opportunity." Although the transit was certainly going to happen, I posted that this one would have to take place without anyone seeing it from Westchester or anywhere else in the clouded-over tri-state area. Of course I was disappointed, but I had already seen one Venus transit and was thankful for that. At about 6 PM, I started to make dinner. As I was busy in the kitchen, I saw through the west-facing window an unmistakable shaft of light. There was a bright, yellowish flash, and sharp shadows fell in the house for the first time that day. It didn't last for more than a few seconds, but I knew that there must be a break in the clouds. I dropped everything, put my camera and the telescope in the car, and headed quickly to my favorite view of the western sky at the Rye Ridge Shopping Center. Five minutes later I was there. Clouds obscured the sun, but I pointed the 'scope where the sun should be, focused on the clouds, got the camera ready, and waited. For ten minutes, from 6:32 to 6:42. Then, through a veil of clouds, the sun broke through. For the next ten minutes the setting sun broke in and out of the clouds, but I was able to take 30 pictures. As in the image from eight years before, the clouds were clearly visible. That may not be ideal for scientific astrophotography, but I like so much the reminder that the image was taken from the earth... through the moving clouds of a living planet. All in all, I was very lucky to get this picture… and luckier still to be able to see and record both of this century's transits of Venus. The next twin transits will be visible from earth in 2117 and 2125. Now here's a transit story that makes me feel even luckier. Has this ever happened to you? You spend a day that you had planned for a month in advance ... the weather is perfect, and the place is spectacular. At the end of the day, as the light starts to fade, you know you have taken what you think will turn out to be remarkable, stunning photographs and all shot with your best camera with your best lens. You get home or, better, to your studio. And then something absolutely catastrophic happens. The pictures are gone. Gone. No files. Nada. Something has crashed and crashed drastically. Maybe the SD card cannot be read, or you erased all the images by mistake. Or worse, you get them into your computer and you see how great they really are and then the computer crashes and you haven't backed any of them up. That kind of thing ever happened to you? Well, it's happened to me and more than once and in two separate worlds. Back in the darkroom days, when we didn't know we were living in an analog world, and nobody knew about computer crashes because nobody had a computer, in those darkroom days there was no quick way to erase what you've taken. Oh no, you had to work at it. You had to really mess up. Those images were recorded on a thing you could touch. In the digital world you can do everything right and still lose your data. Some glitch, a crash. Or no electricity. In the analog world, you don't need electricity because pictures are made of stuff. Stuff like film and paper. Stuff you can touch. You should never leave things to the last minute. It's one of the universal laws: If you leave things to the last minute everything that can go wrong will go wrong. Sometimes very wrong. Before digital photography, there was Tri-X 120. I had taken some black and white publicity pictures with Kodak Tri-X film, and they had to be delivered the next morning. I was busy all day, and I put off developing the Tri-X negatives and printing pictures until way late in the evening. The time had finally come; I couldn't put it off any longer. I went to my basement darkroom and, in the dark, I loaded the 120 film into the light-tight developing tank. 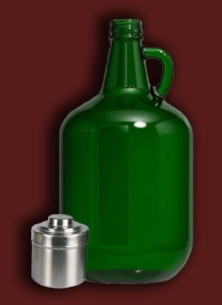 I went back up to the kitchen and picked up the green glass gallon bottle of D-76 Kodak Developer. On my way to the sink, in my haste I knocked the bottle against the corner of a metal table. The bottle shattered, and the developer went all over the floor. A smelly, wet liquid mess spread quickly across the linoleum and started seeping under the refrigerator. If there were any late-night mice around, they were scattering. What could I do? This is a paying job. I had all of these negatives to develop by tomorrow and no stores with powdered D-76 were open at 2AM and certainly there was not a dream of Amazon Now. I had only one possible, long-shot of a choice: mop up the developer and use it. So I got out the mop, cleaned it, and started mopping. After five minutes, I had the mop had absorbed nearly three-quarters of a gallon of D-76 (more like D-76+) and squeezed it into a kitchen pot. It looked just like the dirty water you get after you mop a kitchen floor. Stands to reason. I then filtered the developer into a plastic bottle using a funnel and a paper towel. The stuff was still plenty dirty, but I poured it into the developing tank and started to time the process and agitate the tank (one minute intervals of swishing the solution). I added about a minute to the developing time just to be on the safe side. Whatever it was, it did the trick; the negatives developed normally and the pictures were delivered the time. A crash is a crash, analog or digital. Some you can't recover from, some you can. The only difference is onomatopoetic; an analog crash, like the breaking of a green glass bottle, can be heard. In the digital realm, the crash is silent. So, have you had any crashes... digital, analog, or otherwise?